We've heard about the benefits of baby-led weaning before, but is this method safe for infants? Here's what a recent study finds. Your child is ready for solid food—but like any parent, you're probably afraid of how baby will react to this change. Having mashed avocado flung onto the wall of your kitchen is nothing compared to the anxiety many new parents have around choking or gagging when their baby starts to eat food that's not breast milk or formula. So while you may have heard that the baby-led weaning food trend has become more popular lately, and might ward off obesity in the future, it's only natural for you to wonder how safe it actually is for an infant to essentially feed himself. According to a recent study published in Pediatrics, baby-led weaning—which refers to the process of allowing your child to eat those first few solids independently (under your supervision, of course)—appears to be just as safe as traditional spoon feeding. Researchers performed a randomized controlled trial on 206 healthy infants: Some of these infants used the baby-led introduction to solids (BLISS) method, while others were more traditionally fed. The study's authors collected information about whether the babies choked or gagged while eating via questionnaires. While a total of 35 percent of the infants surveyed did choke at some point during the trial, the researchers did not find a difference in frequency of choking between infants practicing the BLISS method and those who were spoon-fed. While the baby-led infants gagged more when tested at six months old, they gagged less than the traditionally fed infants at eight months. In other words, if at first you don't succeed with baby-led weaning, try again. 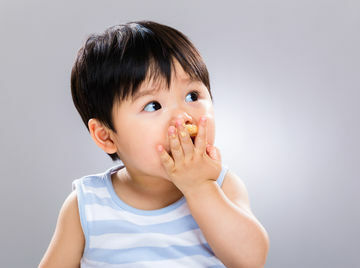 According to Rachael Taylor, a research associate professor at the University of Otago in New Zealand who was involved with the study, researchers initially chose to study this topic to examine the link between baby-led weaning and obesity prevention. "We became interested in baby-led weaning when investigating how best to prevent obesity early in life. The idea of continuing to let the infant feed themselves—like they do when they are breastfeeding—as a way of promoting better appetite regulation was intriguing, but required testing as there was very little evidence. It also raised concerns—such as potentially increasing the risk of choking," Taylor told Fit Pregnancy. "It was reassuring to see that infants following our modified form of baby-led weaning—specifically addressing how to reduce the risk of choking—did not appear to choke more often than babies following more traditional spoon feeding." But that's not to say parents shouldn't take precautions if they chose to allow their babies to lead the weaning process. Supervision is key, as is ensuring you're only allowing your children to reach for foods they can safely swallow. See below for some general rules of thumb. "We think our results show that as long as some general safety principles are followed, it appears that baby-led initiatives can be a suitable alternative to more traditional infant feeding practices. We do not suggest that [baby-led weaning] is safer per se, but as long as some general safety principles are followed, it appears that baby-led initiatives can be a suitable alternative to more traditional infant feeding practices," Taylor said. "However it is important that parents wait until the six-month mark before they begin—to ensure that their infant is developmentally ready to try feeding themselves." The researchers detailed a few guidelines all parents should keep in mind if they choose to use the BLISS method. Test foods before they are offered to ensure they are soft enough to mash with the tongue on the roof of the mouth (or are large and fibrous enough that small pieces do not break off when sucked and chewed, especially in the early months. Strips of meat and toast fingers (served with things like hummus, peanut butter and mashed baked beans) are good options, according to the researchers. Make sure the infant is always sitting upright when they are eating, never leaning backwards. Never leave your baby alone with food: always have an adult with the child when they are eating. Never let anyone except your baby put food into her mouth: the infant must eat at their own pace and under their own control. Speak with your doctor before trying this method and ensure your baby is sitting up independently before allowing him or her to eat solids.